What weight loading is a mezzanine floor limited to? Most weight loadings can be accommodated with a Hampshire Mezzanine Floor mezzanine floor, from light office occupation to the heaviest of industrial applications. All our floors are custom designed to ensure suitability to your requirements. What is the standard height of a mezzanine floor? There is no standard height for a mezzanine floor, each floor will be designed to suit your requirements and to suit the use of applications. However sensible health and safety considerations and practical constraints will always be addressed by Hampshire Mezzanine Floor to ensure a cost effective and workable design is achieved. Do I need to get Planning and Building Regulation Approval before I can install a mezzanine floor? Hampshire Mezzanine Floor always advise that Building Regulations are required and we are very experienced in getting approval in a quick and painless process, ensuring that the floor complies to the relevant BRE Digest 437 codes and to meet Building Regulations Approval. Planning Approval is not normally required unless there are specific restrictions on the premises or a planning stipulation based on usage. How quickly can a mezzanine floor be installed? The installation of a mezzanine is a quick, simple process as all the fabrication work is carried out away from your premises and the mezzanine floor is delivered as a complete kit that is then assembled at your premises. What disruption will there be when installing a mezzanine floor? Hampshire Mezzanine Floors will minimise disruption to you and your company by planning the best logistics of installation and timing. Hampshire Mezzanine Floor have been installing mezzanine floors nationally for over 26 years and have considerable project management experience. Where do I find other trades to complete the mezzanine project? Hampshire Mezzanine Floors can provide a complete turnkey package for office fit-outs, storage solutions, production and retail applications, organising all other trades including partitioning, fire protection, lighting, fire alarm systems, shelving, conveyors and lifts. Hampshire Mezzanine Floor can provide full project management from small floor only installations to major building refurbishments, saving time and money on external consultants and surveyors. Do I need to inform the landlord if I want to install a mezzanine floor? Most landlords will require you to inform them of any proposed works and will normally require confirmation that Building Regulations Approval will be obtained by the contractors. 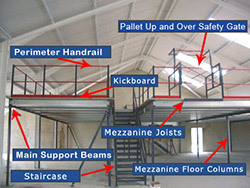 Hampshire Mezzanine Floors can provide specification layouts for your landlord if required. Are all mezzanine floors the same in terms of quality and price? No. Hampshire Mezzanine Floor provide a top quality custom designed floor which complies to current BRE Digest 437 and Building Regulations, at a competitive price. Are your installers fully trained? Hampshire Mezzanine Floors operatives are fully insured and trained to operate required plant and equipment and are certified to nationally approved standards.